How Do I Figure Out What My Salary Should Be? A very important question and one that we often ask ourselves as we traverse jobs in our career. What is a fair salary for my experience and skills? How much do my counterparts make who do similar work? How do I find out my real market value? These are essential questions whether your negotiating salary for a new job or asking for a raise in your current job. It is important to stay informed so you can take action and get paid more. At Paysa, this is our specialty and mission to help you know your worth, empowering you to advance in your career. So how do you figure out if you’re being paid enough? Find out what employees make for the same or similar job at your company. Paysa uses proprietary data science, machine learning, and artificial intelligence to analyze publicly available information for all salaried employees in the United States. Start by going to Paysa salary calculator and input your company, job and location or any combination thereof. In return, you will get total comp, broken down by base salary, equity and bonus. Additionally, you will see more data insights for job skills, education, ethnicity, and gender. Here is an example of the salary for a Google Software Engineer. Keep in mind that your pay isn’t just the base salary. It can also take into account equity and performance bonus, and sometimes sign-on bonus. And money aside, there are company perks that may sway your decision. Once you are armed with the knowledge of how much someone in your role should be making, you can use this data to make a solid case for why you should be paid more! See our video on How to Ask Your Boss for a Raise. Should You Be Getting a Raise? Have you worked in the same organization for a while and not received a raise? If so, you are likely underpaid. The experience you have accumulated over the years may not be factored into your pay. New hires for the same role might be getting paid more. If you are planning to ask for a raise, here’s how to use Paysa to gather data to support your ask. Start here at Raises and type in your role, company, salary and a few other details. And you will see how your salary compares with the market average – above or below. Find out if you’re due for a raise by comparing your current salary with the market rate. Share this information with your boss and have a meaningful, data focused discussion. See our tips on the best and worst times to ask for a raise. And this one about how to negotiate salary with your manager. Looking for opportunities in a different city? Location plays an important role in your compensation. Depending on whether you work in a small town or a big city, companies will have different pay packages and perks. You must factor in the cost of living when checking average pay packages for a position. A salary in one city might be $30,000 higher than another, but higher housing costs and other expenses might mean that you end up saving less. 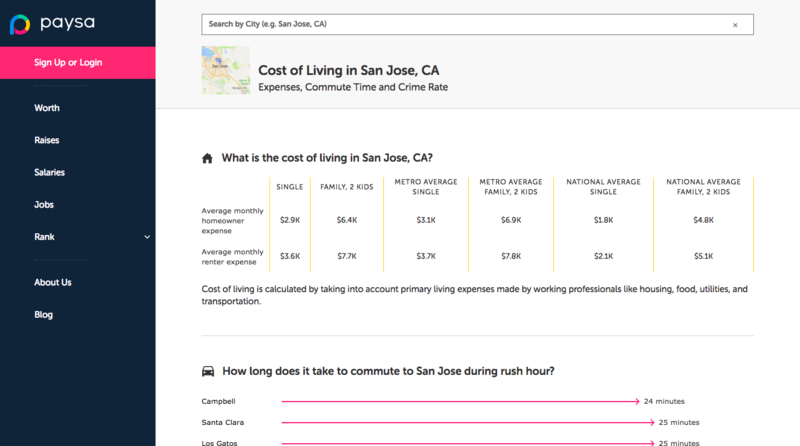 Check out our cost-of-living calculator to get insights into the cost of living across different cities. Our calculator arrives at living expenditure by taking into account aspects like housing, transportation, utilities and food. It will also provide insight into commute time and crime rates, so that you can take into account a wide range of factors while making a decision. Be Informed. Take Action. Get Paid More. Employees usually get a 15% raise when they ask for it. And knowing your market value makes it easier for you to ask for that raise or negotiate a better pay package. In the end, knowing your worth will not only help you broker a better pay package but also influence your self-confidence. And confident employees perform better at their job which in turn makes them highly valuable! Want to know more? Sign-up for a free account at Paysa.com to get your personalized market value report. Tags salaries what should be my salary? Next ArticleGrubHub vs. Instacart: Who Pays More?